A few years ago, Game Of Thrones producer Frank Doelger scared the petrified dragon eggs out of HBO when he declared that the show would only go on for seven seasons. The idea was that the people behind Game Of Thrones don’t want the audience to get sick of it as it drags its feet in anticipation of George R.R. Martin doing that thing he’s supposed to be doing (whatever it is). Now, to some people, this would be a reasonable idea. 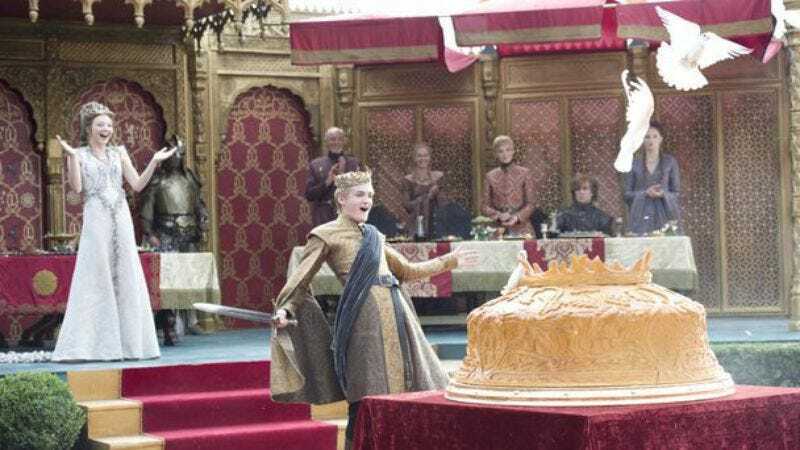 Game Of Thrones is an exciting show, and nobody wants it to turn into a boring slog (storylines that are already a boring slog notwithstanding). To HBO, however, this is a terrible idea. It would rather give Thrones its seven seasons, then ease it into another seven, then maybe another seven after that. Or it’ll just settle for 10. That comes from an interview that HBO programming president Michael Lombardo gave to Entertainment Weekly, in which he admitted that Thrones showrunners David Benioff and Dan Weiss would probably rather end their show after seven, but he’d prefer it to go on for 10. “If they weren’t comfortable going beyond seven seasons,” he told EW, “I trust them implicitly and trust that’s the right decision—as horrifying as that is to me.” He also added that he doesn’t want to “have a show continue past where the creators believe where they feel they’ve finished with the story.” So Lombardo would like the show to go on forever, but he’ll let Benioff and Weiss end it sooner if that’s what they really really really want. One thing Lombardo doesn’t want, though, is a movie. He admits that he’s had conversations about how cool that would be but, ultimately, it would be too much like “changing the rules” for people who followed Game Of Thrones on HBO. He says making viewers pay for HBO in order to see the show, and then pay for a movie ticket to see the movie, would be unfair. EW theorizes that HBO might pull an AMC and start splitting seasons up in order to give Martin more time and keep the show on a little longer, but Benioff and Weiss would probably be just as opposed to that as they are to more seasons in general. Either way, Game Of Thrones will end whenever Game Of Thrones ends, which is exactly the sort of vague timetable that fans of this series have come to expect.